For inclusion in Concrete Pier Pouring. 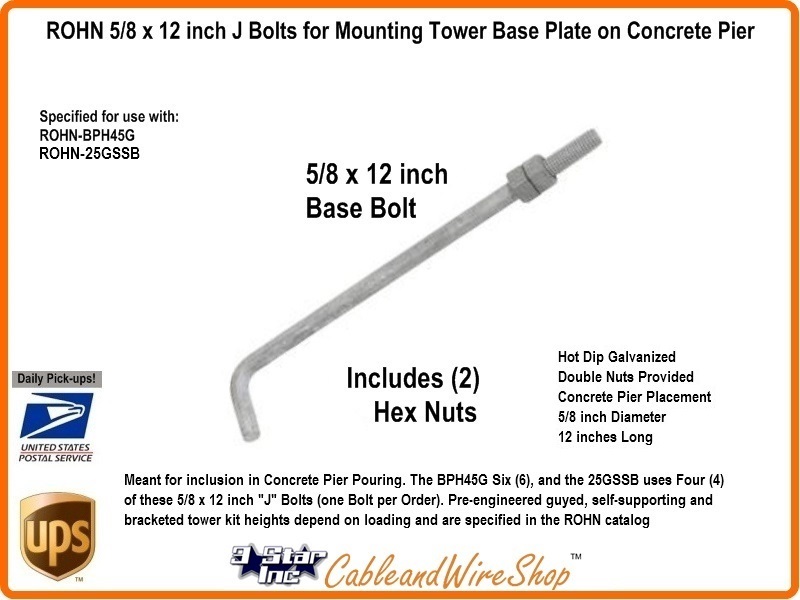 The BPH45G Six (6), and the 25GSSB uses Four (4) of these 5/8 x 12 inch J Bolts (one Bolt per Order). Seek Engineering notes in Spec. Sheets. Suspend bolts in concrete pour by means of template or jig. Pre-engineered guyed, self-supporting and bracketed tower kit heights depend on loading and are specified in the ROHN catalog. Note: All ROHN Tower Installations should be temporarily Guyed during erection or Take-Down.